The name Pleyel is first and foremost associated with the history of the piano. In 1807 in Paris Ignaz Joseph Pleyel founded a firm for the building of pianos. He adopted the English action, and this was to become the standard in piano making down to the present day. Many composers of the 19th century including Chopin had a strong preference for Pleyel's pianos. In 1795 he had settled in Paris, opened a music shop and started printing music. His firm published around 4,000 compositions, by Pleyel himself, but also by some of the leading composers of the time, like Haydn, Boccherini, Beethoven and Clementi. At that time his own composing had strongly diminished. Some music-lovers probably didn't regret that. Charles Burney wrote that "critical observers" had noted that "his fancy, thought at first so fertile, is not so inexhaustible, but that he frequently repeats himself, and does not sufficiently disdain the mixture of common passages with his own elegant ideas". Pleyel was born in Ruppersthal in Austria and received his first music lessons from Johann Baptist Vanhal. He became the protégé of count László Erdödy who was related to Haydn's patrons, the Esterházys. This resulted in Pleyel becoming Haydn's apprentice. His first stage work was a marionette opera which found its premiere in Esterháza and in Vienna. The next stages of his career were as Kapellmeister to count Erdödy in Pressburg and then as assistant and later successor of Franz Xaver Richter in Strassburg. Soon the French Revolution put an end to the religious functions of the cathedral and to all public concerts. Like Haydn Pleyel accepted an invitation to London, in his case by the 'Professional Concert', organised by Wilhelm Cramer. This was a rival of Johann Peter Salomon's Haydn concerts. But the enmity and fierce competition between the master and his pupil many people expected - and hoped for - did not materialize. Haydn and Pleyel were on friendly terms, spent time together and attended each other's concerts. Haydn was the more popular composer but Pleyel certainly had success too. There is no doubt that Pleyel's music is strongly influenced by Haydn, as Mozart observed in regard to a set of string quartets, probably Pleyel's opus 1. Even so, the four trios for keyboard, violin and cello which Trio 1790 has recorded contain enough individual elements to make them an interesting addition to the repertoire. Pleyel composed 50 trios, and this disc presents four from three different sets. The first set of six was published in 1788; one of them is the Trio in e minor (Ben 435). The first movement is longer than the other two put together. It is dominated by one motif which is presented by the keyboard alone at the beginning. The second is very short, and the piece ends with a rondo, one of the favourite forms in classical chamber music. Here the violin plays an extended role. In 1790 and 1791 the next six were printed in two issues. It is telling that they were published by four publishers, reflecting the popularity of Pleyel's chamber music. The Trio in C (Ben 441) is again in three movements. It is notable that the opening allegro molto is preceded by an adagio, quite unique in chamber music of the time, even though this introduction lasts ony four bars. The second movement is again in a then popular form, a theme with variations. In the first variation the violin plays a notable role, whereas in the third the keyboard and the violin step back to make way for the cello to play a solo line. The trio ends with a movement which shows the influence of folk music. The Trio in f minor (Ben 442) seems to have a rather sombre character, but soon turns into the major. This trio has only two movements; the second is a menuet in the minor with a trio in major. Elements of folk music also turn up in the Trio in A (Ben 448). It is one of 18 trios Pleyel composed for George Thomson, a folk-song enthusiast from Edinburgh, who invited several composers to arrange Scottish folk-songs for voice and piano trio, like Haydn, Beethoven and Kozeluch. Pleyel also wrote such arrangements, and in addition he incorporated folk-song material in the trios he wrote for Thomson. In this particular trio the second movement is called 'Rondo Ecossais' with the indication 'allegretto scherzando'. Piano trios were particularly popular in the last decades of the 18th century. Haydn wrote a large number, which Trio 1790 has recorded complete. They also have recorded trios by the likes of Kozeluch and Dussek, alongside better-known composers like two Bach sons and Beethoven. This recording of four trios by Pleyel reflects their sense of adventure. Although trios by Pleyel have been recorded before, as far as I know only one other disc exists with performances on period instruments, by the Pleyel Trio Wien (Gramola). I haven't heard that disc; fortunately only the Trio in f minor appears on both. The playing of the Trio 1790 is of the highest order. Harald Hoeren is one of the founding fathers of this trio, and the only one still playing in it. The tracklist says that he plays 'harpsichord (Fortepiano)'. Where did that come from? There is no harpsichord played here; that would be highly inappropriate. The fortepiano is not specified. It sounds like an instrument with German action, and I just wonder whether a fortepiano with English action would have been more suitable for the later trios. In these trios the keyboard has the lead, and Harald Hoeren takes it. His dynamically differentiated playing is a joy to listen to. Annette Wehner is an excellent violinist with a beautiful tone, blending perfectly with the keyboard. The solo episodes are very well executed. The cello has a minor role in many piano trios of the classical period, and that is also the case here. The solo in the third variation of the Trio in C is nicely played by Jennifer Morsches, also known as a member of the Orchestra of the Age of Enlightenment. 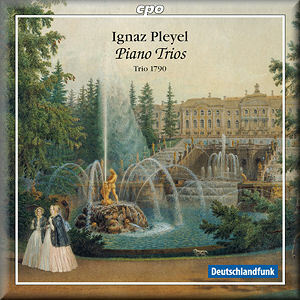 Those who love the classical piano trios by the likes of Haydn and Mozart will definitely enjoy this disc. More recordings with music by Pleyel would be very welcome.